What happens when sibling rivalry goes awry? As challenging as it is during one’s formative years when it’s an ongoing quest to prove via Mother’s Day gifts, handmade cards and good deeds that “Mom likes me the best,” fractious relationships with brothers and sisters tend to escalate in adulthood if a deceased parent’s final wishes are neither written down nor carried out. 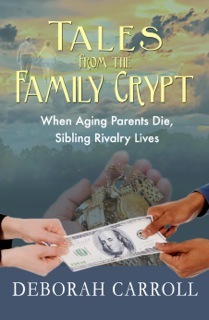 In her latest book, Tales From The Family Crypt: When Aging Parents Die, Sibling Rivalry Lives, Deborah Carroll serves up an entertaining and insightful retrospective of dysfunctional family dynamics as seen through the lens of personal experience. Q: It’s often said that truth is stranger than fiction. Would you say that’s an apt label for the vitriolic interactions that transpire(d) in your own family tree? Q: At what point either growing up or becoming an adult did you and your husband start to see that your respective siblings were teetering toward dysfunctional? Was there an inciting incident, for instance, that ignited a succession of destructive behaviors toward one another or did such behaviors actually exist all along and become more pronounced with the passage of time? A: We thought we had normal families growing up. In retrospect we were forced to conclude something must have been rotten in Denmark (or on Long Island and in Philadelphia, respectively) for things to go so horribly awry. Kids know no reality other than their own, though, so perhaps very few find out early in life something is amok in their families. When my husband and I were young marrieds and beginning our life together, we began to notice things which didn’t quite fit our vision of happy family, though. When my sister-in-law had children – the first in the family to do so – she chose to have her kids call her friends “Aunt” and “Uncle” but they didn’t call their actual aunts and uncles that. My mother- and father-in-law were afraid to ask her about it. That began a lifelong pattern of people in the family not communicating honestly how they felt. When my sister inexplicably stopped talking to me and refused to say why, that was a red flag too. Q: What prompted you to write a book about these unsettling experiences? A: We didn’t see these difficulties coming and my husband and I are analytical people, so we’ve spent years discussing how the whole family saga played out. We wanted to understand our part in it and even more so to make sure we did things differently with our children. When the last of our four parents died and the drama reached astronomical levels of dysfunction, it was such an interesting story I thought it worthy of sharing. Maybe more importantly, the number of people who have similar craziness in their own family is astounding. Reading about how we dealt gracefully with the adult sibling rivalry and the isolation from our family could help others know they’re not alone and maybe learn strategies for dealing with this dysfunction. Q: I take it that their reaction to your decision to publish was less than pleasant? A: OMG! I didn’t use anyone’s real name or any identifiers so no one would have or could have known who our family members really were unless they told them. So, they could’ve just kept quiet and no one would’ve been the wiser but if our siblings were that smart, we might not have had a problem in the first place. Nope, they didn’t keep quiet. First they wrote scathing reviews of the book on Amazon. My brother-in-law wrote under the screen name MISC. I think he meant ANON as in anonymous but he’s not the sharpest tool in the shed. It was obvious it was his review from the things he said. Not only did he write a review (which started with “Hitler wrote a book justifying his behavior too.”), he began commenting on every review. All were 4- and 5-star reviews and there were about 20 or so fairly soon. I happen to know this is one of the authors (sic) friends and this review along with most of the other highly rated reviews is bogus. I was pretty curious to see what “best was yet to come” and what the “real truth” was because honestly I lead a pretty boring life so if he was going to say something juicy about me I wanted to hear it. Alas, he revealed nothing. And eventually Amazon deleted his comments (And then he’d write another comment about how I was deleting his comments but they deleted those, too.) but they did leave his “Hitler” review and you can see it if you check out the listing on Amazon. My sister-in-law employed a different strategy. She and her daughter wrote nasty reviews, not of the book but of me, referring to me as “evil, controlling, egomaniacal and nasty.” They hired a lawyer who threatened to sue me. Ultimately, he had to admit there was no case and no lawsuit would be forthcoming. I think he advised them to delete their reviews or maybe Amazon did but both reviews are gone and I haven’t heard from them since I spoke to their lawyer and let him know he failed at scaring me because I knew I had a legal right to tell my story. My niece also Googled my name and contacted other places my work (unrelated to the book) appears to trash me and threaten them for publishing my writing. I sent her a few emails telling her what she was doing constituted defamation and eventually, after their lawyer told her to stop, she did. Q: The argument could be made that certain things which happen in the privacy of one’s home shouldn’t be aired publicly. What are your own thoughts about that? A: Believe it or not, there were anecdotes about our siblings I did not share. I included incidents germane to the family dynamic but left out personal aspects of their lives that would embarrass them but not add anything to the story. Q: The book is defined as “narrative nonfiction memoir.” Why did you take this particular approach rather than penning it as straight fiction with just enough separation of personality tags so as to keep the wrongdoers from going ballistic? A: I could have written this book as fiction. Many people suggested that would be a kinder and gentler way to go, rather than to present our family members as they are in real life. I opted for nonfiction because I thought if I made up characters who did the things our siblings actually did, readers would not find them believable. My story reads like fiction but I thought it important for readers to know every word is true. I felt the story was more powerful because it was real. Seriously, if you read a fictional work about a character who sued her sister over, among other things, 8 plastic corn cob holders, wouldn’t you reject that plot point as exaggerated and ridiculous? But it happened. As to the wrongdoers going ballistic, I suppose I just didn’t care anymore. None of our siblings speak to us anyway so I had nothing to lose. Readers fully understand why that estrangement is in many ways a gift. These are not people anyone would want in their life. Q: Okay, let’s say that Hollywood comes calling and wants to make a movie about Tales From The Family Crypt. Who’s your dream cast or would you go with an ensemble of unknown actors so as to make the story more relatable to an audience? A: I love this question and this is the first time anyone has asked that. Unknowns? No way, I want big names! My husband has to be played by Richard Gere because he’s always thought he looked like him. (No comment, I prefer to stay married.) Me? Young me should be played by Jennifer Lawrence. She works and plays well with crazy based on her performance in “Silver Linings Playbook” and she can shoot to kill based on “The Hunger Games,” so I think she could handle our crazies. Older me? Susan Sarandon. We have similar hair. Q: What was the hardest part of the book for you to write? A: The end. I try to look back and see where it all went wrong. It was painful and difficult to figure out but for the book to be an honest account, it had to be done. A: My father’s death chapter. It was (and yes I know this makes me sound a bit nuts) beautiful to live through, to witness his graceful and peaceful transition from life to death. He died in my home with my husband, my three then-young daughters, and me. He lived his last few weeks surrounded by love and died the same way. It was my honor and privilege to take care of him. Q: Did catharsis enter into the equation during the book’s development? A: I’ve counseled others repeatedly – if you live through something like this and you are holding on to anger, to grief, to guilt, to unresolved issues, write it down so you can let it go. Q: Litigious society we live in these days, did you consult an attorney prior to moving forward with publication? A: I didn’t speak to an attorney but I researched the laws carefully. While I could have legally used their real names, I chose not to in order to have an extra measure of privacy protection for my siblings. Q: Let’s step back to childhood a moment. There’s been no shortage of psychological studies on whether the influences of a dysfunctional home life will cause children to either repeat those patterns when they become parents themselves or do a complete reversal (i.e., a son whose father was frequently absent will subsequently want to be a very engaged “pal” to his own offspring). What was the case for you and your husband in terms of raising and guiding your children? A: We have three amazing daughters, all of whom have grown up to be teachers, a lovely reflection of who they are. Our experiences with our families absolutely directed the parents we were and the way we raised our daughters to love and respect each other, to value the family and to understand that strong relationships require work and begin with love and honesty and trust. Q: What is your family like today? A: We are so grateful. We laugh together, we’ve worked together and played together and now it’s passing to the next generation as we have the most awesome two-year-old grandson who pretty much rocks the Carroll family world. I think the dysfunctional family made us treasure what matters most – each other. In a way we felt like it was us against the world at times and we came through it stronger. Q: If you had life to live over, what would you do differently to change your family situation? A: Hardest question ever… I’d implore our parents to communicate more or at least some and to be honest with all of us, something they were woefully unable to do. Maybe I would have tried to understand the siblings better earlier on. They are challenged people. I used to see some of them as evil. I’ve come to understand they’re not evil, just a mess. A: I’m not as nice as I’d like to be but not as bad as my siblings would have anyone believe. On a lighter note, I run 4-5 miles a few times a week. It helps me process and write. Q: There’s nothing that can tear families apart faster or uglier than estate issues, especially in cases where beneficiaries assume a level of entitlement that doesn’t necessarily mirror reality. Is there anything people can do to prepare for – as well as avoid – the types of infighting, inheritance battles and rivalries that erupt when parentals pass away? A: Absolutely! The power lies mostly in the parents’ hands, though. Communication is key. The battles can largely be avoided with open talks about end of life care and wishes, about death and money, three things people are loath to talk about. We need to tear down those taboos if we are to avoid the fighting. Newsflash: you are going to die, talking about it won’t make it happen and not talking about it won’t stop it from happening. But talking about it can make it easier on the dying and the living. Q: Why should people read your book and what do you believe is its strongest takeaway value? A: Read it first because it’s a good story, well told. (If I do say so myself. But then reviewers say so, too, so it must be true.) Second, it may help you deal with any family issues you might encounter and if you are like most people, sadly you may encounter them so forewarned is forearmed. Q: Is this the first book you’ve written? Will it be the last? A: I’ve written two parenting books, published by Penguin and Berkley Books in the 90s. I even appeared on Good Morning America with one of them. (One of the most embarrassing events of my life. If you meet me, ask.) I’ve just updated and self-published that one, “Raising Amazing Children: While Having A Life of Your Own.” It’s on Amazon. I’m currently working on a children’s book, “Real Grandparents: From A-Z, Everything A Grandparent Can Be.” I’m writing that one because I don’t love the way grandparents are portrayed in children’s books. They seem to wear nightcaps and knit (not that there’s anything wrong with that!) and spend a lot of time rocking and not in a good way! My grandparent friends are vibrant and active people. We run, we play hard, we work hard, we’re creative and talented. I think it’s time for an image upgrade for all of us grandparents out there redefining aging. A: If you read my book, please consider reaching out to me to let me know your thoughts. I’m so grateful to readers and especially to those who take a moment to check in and share their reactions.